THE NIGHT DIARY is filled with intimacy and immediacy. It transported me halfway around the globe and back seventy years to the portion of India that was about to become Pakistan. The writing here is beautiful, and the intense, in-your-face storytelling results to some extent from the manner of the telling. Twelve year-old Nisha, a girl of few words when out in the world, writes insightful and revealing journal entries at night to her mama, who died giving birth to Nisha and her twin brother Amil. Despite the closeness of the twins, Nisha shares many thoughts and feelings only with her mother. The story begins just before the British cede control of “old” India. This transfer of power resulted in the immediate partitioning of India into “new” India and Pakistan. In the largest mass migration in history, Hindus were compelled to depart newly-formed Pakistan, crossing the partition line in one direction, and Muslims departed new India, crossing in the other direction. Where followers of different religions had coexisted, suddenly there was hate and violence. More than a million people died during this exchange. In the midst of this heartbreak, chaos, and carnage, Nisha, Amil, their physician father, and their paternal grandmother must quickly leave behind their lives, home, possessions, and friends. They also must leave behind Kazi, the paid chef who lives in their back cottage, with whom Nisha has a deep emotional connection. But Kazi is Muslim. An interesting and important twist in the story is that Nisha’s dead mother was Muslim. Nisha’s mother and father were both estranged from their families when they married. The twins, who are classified as Hindu like their father, are technically, fifty-fifty Hindu and Muslim. One of my hobbies is cooking vegan Indian cuisine. I adored Nisha’s sensory-laden details of shopping, cooking, and savoring food, which were almost cinematic. Sadly, the world we inhabit today has yet to resolve the conflicts that so perplex Nisha all those years ago. Musim/Hindu intolerance and violence in India and Pakistan still erupts periodically, with tragic results. And far too many in the U.S. and elsewhere hold ignorant views on Islam, contributing to the never-ending hatred and bloodshed. The Partition was a major world event that is underrepresented in children’s literature. THE NIGHT DIARY is a beautifully-written, distinguished piece of historical fiction. It’s a truly moving and memorable read. It's 1947, and India, newly independent of British rule, has been separated into two countries: Pakistan and India. The divide has created much tension between Hindus and Muslims, and hundreds of thousands are killed crossing borders. 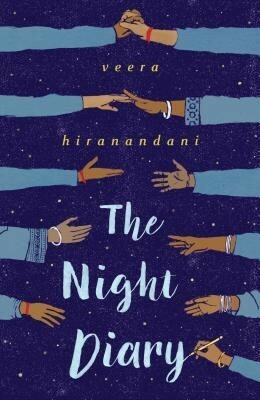 On the eve of the Partitioning of India in 1947, Nisha is struggling to understand the implications of the end of British rule on her half-Hindu, half-Muslim family, and writes diary entries to the mother who passed away when she and her twin brother Amil were born in order to process events. Her father, a Hindu doctor, feels that the family must leave their town, which has ended up as an area designated to be Muslim. Long time family cook Kazi is Muslim (as was Nisha's mother), so he will remain behind. Accompanied by their grandmother, the group sets out on foot to walk about 100 miles to the house of the mother's brother. Conditions are horrible, with fighting and violence all around, as well as very little food and water. Amil falls ill, the group is attacked by a man who has lost his family, but they eventually arrive. Nisha is glad to meet her uncle, who looks a bit like pictures of her mother, although he has a cleft palate and does not speak. Once the family is able to settle in Hindu territory, they have a small apartment but are glad to have made it to safety. Strengths: This is loosely based on some of the author's family's experiences, which makes it more interesting to me. I find the Partition to be my second favorite horrible historical event (the first being the Triangle Shirtwaist Factory fire), and this gave a good overview of the politics, but concentrated on Nisha's experience. There are good descriptions of what it is like to have to walk long distances and survive under horrible circumstances, and the connection with Kazi is sweet. Weaknesses: I can understand why the diary form was employed, but Nisha's longing for her mother slowed the story down. When losing a mother in child birth was fairly common, I don't know that children really dwelt on their loss this much. What I really think: There are a few other middle grade novels that touch on the Partition: Kelkar's Ahimsa, Bradbury's A Moment Comes and Outside In, Senzai's Ticket to India and Venkatraman's Climbing the Stairs. While these don't circulate terribly well, I'm always glad when I can get children to read them, so I will probably buy this one. It's 1947 and the partitioning of India is underway. The British rule is over and now the Hindus must leave the territory that is Pakistan and move back to India where they are welcome. Nisha's father, a doctor, practices the Hindu fatih and her mother was a practicing Muslim before she died giving birth to Nisha and her twin brother. Now they are no longer welcome in the town where she grew up and where her father practiced medicine at the local hospital. With her father, her grandmother, Dadi, and her twin brother, Nisha is setting out on a journey to a place they do not know. They will witness death first hand and Nisha will struggle to understand why Muslims, Hindus and Sikhs are killing each other. Told in journal entries this is an excellent story for stretching our children to a history and culture they may not know well. Perfect for pairing with Amal Unbound by Aisha Saeed, the story of a modern day Pakistani girl.